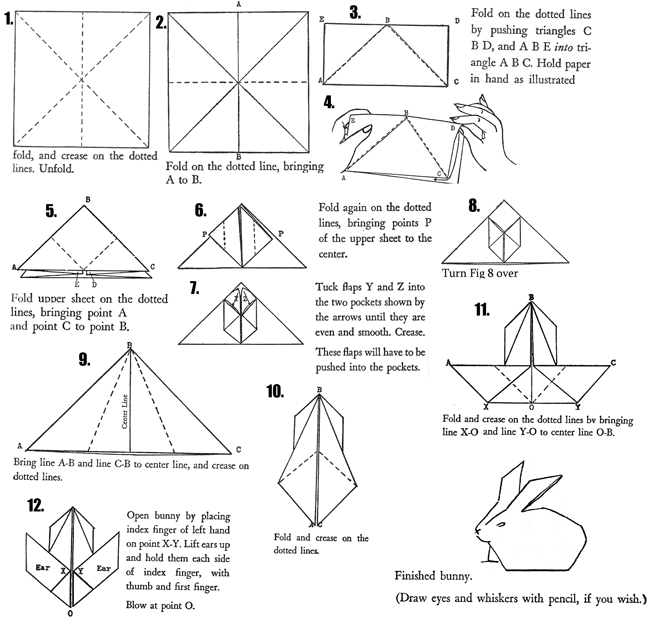 Above you will find diagram illustrations for making your own origami bunny rabbits. Just get a square piece of paper and crease on the dotted lines that you see in figure 1. Then, as seen in picture 2...fold A over to B. Then, as seen in figure 3, fold on the dotted triangle. As seen in figure 5...bring point A and point C to point B. Then as you see in figure 6, you will need to fold again on the dotted lines, bringing points P of the upper sheet to the center. Then follow all the rest of the instructions to make the finished bunny that you see at the end of the diagram. How to Make Origami Bunny Rabbits Directions - Bunny origami model. How to Make Origami Bunny Models Lessons - Bunny rabbit origami model. How to Make Origami Heart Rabbits Tutorials - Heart rabbit origami model. How to Make Origami Rabbits Papre Folding Instructions - Rabbit origami model. How to Make Origami Rabbits Paper Folding Tutorial - Rabbit origami model. How to Make Origami Rabbits / Bunnies - Rabbit origami model. How to Make Origami Rabbits and Bunnies - Rabbit origami model. How to Make Origami Rabbit Instructions - Rabbit origami model. How to Make Origami Rabbit Coasters Tutorial - Rabbit coaster origami model. How to Make Origami Rabbit Letters Instructions - Rabbit letter origami craft. How to Make Origami Rabbit with Wings - Rabbit origami model. How to Make Origami Running Rabbit Model - Origami rabbit model. How to Make Origami Traditional Rabbit - Rabbit origami craft.